Now we come in with our zero-footprint label. Our mission is to create awareness. You have heard of labels for fair trade and organic, but have you heard of labels made with 100% renewable energy? It is about getting carbon emissions down to 1.5 degrees in the next 10 years, the Paris agreement goal. The way we can do this with choices. Our zero-footprint label indicates to the conscious consumer that these products are carbon neutral or made with zero carbon emissions, made with 100% renewable energy. We call them zero emission products (ZEPs). 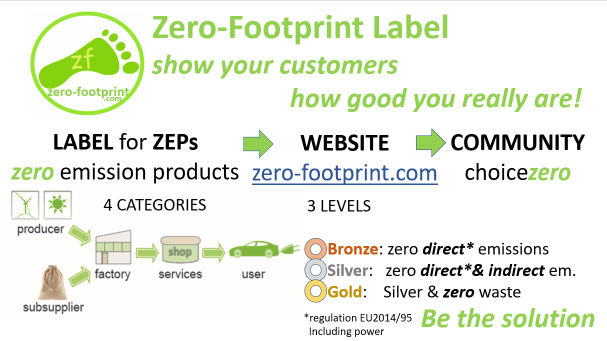 If you are made with zero emissions, with 100% renewable energy, you are eligible for the zero-footprint label. Every choice you make reduces your own carbon footprint. Is vegetarian or vegan better? Aside from health effects, vegetarian and especially vegan food has a much smaller carbon footprint.